Between an early Hanukkah, a late Thanksgiving, and Christmas arriving spot on time, haven’t we been observing holiday traditions for months now? We have a handful of holiday traditions, but we’re just as apt to throw tradition out the window, paring the celebration down to a few essentials to mark the day as significant. For instance, for Hanukkah, we light the menorah every night. Well, most nights. And sometimes more than one menorah, depending on our moods. And we make at least one batch of latkes during the week, sometimes eating most of them just as they come out of the pan, after they’ve cooled slightly on paper towels. Since the days of H’s tiny childhood, every night we hide a blue plastic dreidel (which conceals a few chocolate coins) somewhere in the house for her to find. Most years for Christmas, we make candied orange peels and beef jerky to give to our friends and family. Some years we make jam, or cajeta, or cookies, or granola, or candy, or bread, or pickles, or applesauce, or membrillo. Some years everyone gets some. Some years, only family. Without fail, we cut our Christmas tree with old friends every year. Most years we take the dogs. Some years, it seems a bother. What doesn’t seem to change are the holiday movies. Somewhere in late November, we start singing, “I’m dreaming of a White Christmas…” and then we debate if it’s too early to start watching Christmas movies. Nope. How can be it too early? We watch a variety every year, but the three that we always seem to return to are the classic, singable “White Christmas,” the gloriously moody (and funny) 1951 version of “A Christmas Carol” (or “Scrooge”), starring Alistair Sim, and the gentle, light-hearted “We’re No Angels” (the original 1955, thank you very much). Maybe one or all of these are your family’s favorites, too. Just in case you haven’t seen them, here are a couple excerpts to give you a taste. First, one of our family’s favorite scene from any movie, the part in “We’re No Angels” where Bogart, Ustinov, and Ray debate how and when to tell Cousin Andre that he’s just taken a box with Adolf, the poisonous snake, into his room. That line is like a perfectly baked little cookie we eat only once a year, crisp and full of flavor. If Ebenezer’s rebirth doesn’t bring your heart some holiday cheer, I don’t know what will. 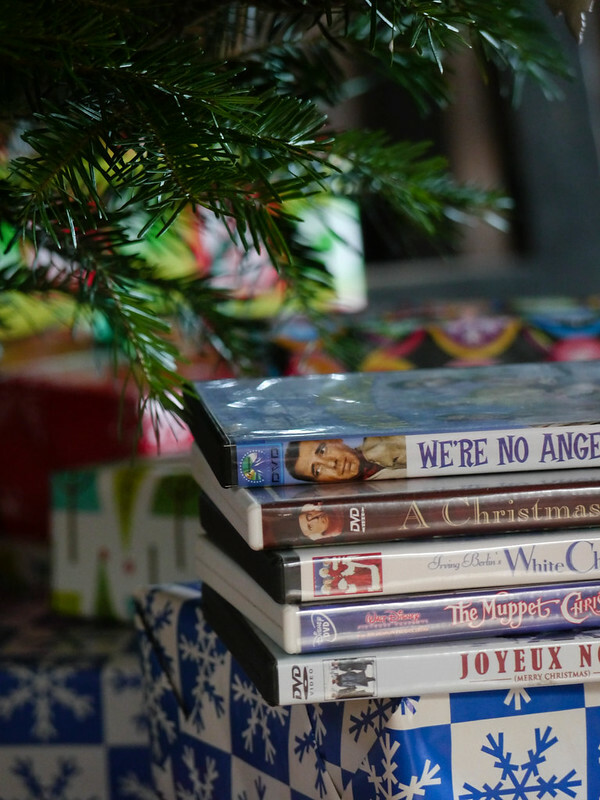 What are your favorite holiday movies (or songs, or books)? Whatever your traditions, or the holidays you celebrate, the people you are with, or the people you are missing, the foods you eat, the movies you watch, the stories you tell, we wish you all a beautiful week, and if it applies, a very Merry Christmas! Merry Christmas to you, your human family and of course your furbabies. May the next year be all that you wish for. TRADITION!! (ala “FIddler” ) always hard to ‘throw one out!” The pickle. Chevy Chase Christmas Vacation. The Grinch. Those ALL stay!! And Tacos on New Years Eve! Tacos on NYE?! Great tradition!